In the first installment of this series, we looked at the incorporation of elements of the hieroglyph for Sirius in the McCain/Obama campaign logos. Next we looked at what certainly appears to be a move to symbolically tie Sarah Palin to Isis and Sirius, starting with her speech at the RNC. What we must remember is that the very term "president" comes from ancient ritual, as does his "inauguration." The term "capitol" (as in "our nation's capitol") comes from a hill in Rome that housed the city's most magnificent temple to Jupiter. And the Masonic roots of the Federal Government and Washington, DC and all of the rest of it are more or less common knowledge these days, thanks to The Da Vinci Code and the National Treasure movies and all the rest of it. So none of this symbolism should surprise us at all, particularly at this stage in the game. 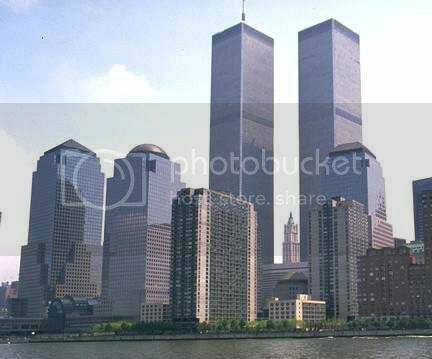 9/11 is the definitive event of the 21st Century- it informs our politics and culture in ways not immediately obvious. Tough-skinned New Yorkers have largely put the trauma behind them, but tens of millions of superstitious bumpkins are still terrified that Osama is hiding in their manure pile and is going to fly a spray plane into the local Agway. 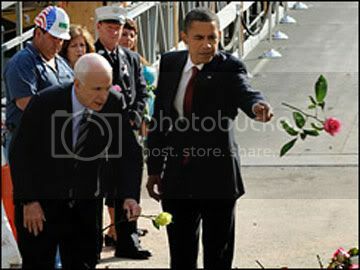 Be that as it may, both John "Oannes" McCain and Barack "Blessed" Obama were at Ground Zero for the seventh anniversary of that horrible day. Here they tossed roses- an ancient fertility symbol- into a reflecting pool, a symbol of the womb. Remember also that September 11 is New Year's Day in the Coptic (that is to say, native Egyptian) calendar, and that technically 2001 was the first year of the new millennium. "I will cause the Nile (River) to rise up for you. There will be no more years when the inundation fails to cover any area of land. The flowers will sprout up, their stems bending with the weight of the pollen." The symbolism of Djoser's words and this Ground Zero ritual are particularly significant in this instance, seeing that the Obama family hails from Kenya, which is bordered by Lake Victoria -- the source of the Nile River. Remember that the Nile was seen as an earthly reflection of the Milky Way. Was this ritual meant as a precursor to some cosmic event? But there is something about where this ritual was performed that also ties back to Djoser. Here is Ground Zero today. 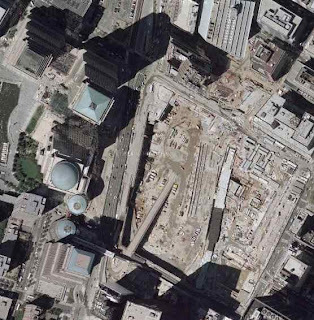 Immediately west is the World Financial Center, which now overshadows the WTC site where McCain and Obama performed their obligatory fertility ritual. Note here that these buildings lie directly on the banks of a river. 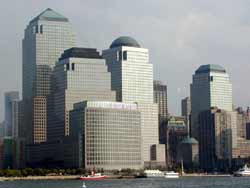 The World Financial Center is composed of four separate buildings, distinguished by the designs on their roofs. We have a pyramid, a step pyramid, a dome and an "unfinished pyramid." If seen from the east, the building containing the step pyramid is hidden. 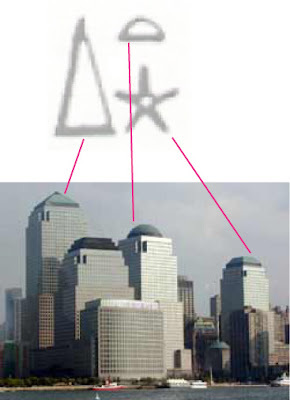 If we mirror the glyph for Sirius-Sothis we see that the three taller buildings of the WFC correspond to it- the building with the pyramid corresponds to the pyramidion, next to that we see the domed roof , and the unfinished pyramid has 5 sides, corresponding to the 5-rayed star of Sirius. So we have correspondence with three of the WFC buildings and the Sirius/Sothis glyph. So what of the step pyramid roof, then? And what do pyramids actually symbolize, anyway? 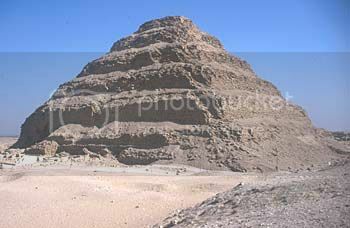 Here's where we refer back to Djoser, since his famous pyramid is built in that step/stairway design. Djoser's pyramid is important since it is believed to be the first of Egypt's great pyramids, and unlike the main structures at Giza is well-adorned with sacred writing. 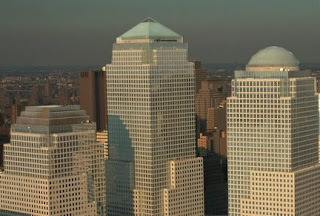 So after the Twin Towers (widely believed to have been symbolic stand-ins for Jachin and Boaz) came down, what was left standing was the World Financial Center, which no one ever noticed when the WTC still stood. 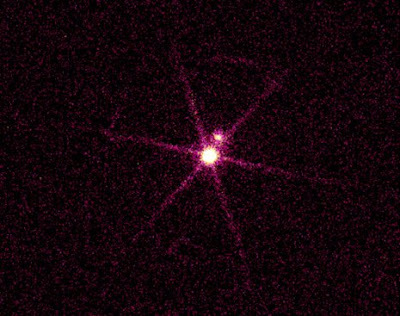 And encoded into the WFC is a Stairway to Sirius, the star system significant to Egyptian religion and the occult traditions and Masonic traditions and Ancient Astronaut Theory. So, as the later Solomonic tradition vanishes from the skyline, it reveals the Stairway to Sirius, almost as if we traveling back in time using architectural symbolism. Which, of course, was the exact modus operandi of the Shemsu Hor. But where else do we find this Stairway to Sirius? Gee, you think there's an AAT basis to Freemasonry or what? Sirius still glitters in our Lodges as the Blazing Star, The Sun is still symbolized by the point within a Circle; and, with the Moon and Mercury or Anubis, in the three Great Lights of the Lodge. But if the icon of the Stairway is so important in this story, where do we see in it this meta-narrative encoded in the campaign logos of this year's Clown Show? If you look at the red stripes as being the treads, it very much looks like a stairway. And it leads to a rising sun. But which sun is this? The more I look at all of this symbolism, the more I believe the sun being venerated is not our egalitarian Sol. Perhaps the point-in-circle motif offers us a clue. Perhaps that actually symbolizes two suns, with one hidden within or behind the other. Which solar system would that describe? The symbolic correspondence between Sirius, the WFC and Obama/McCain campaign logos certainly raises the question: were McCain and Obama paying tribute to Ground Zero or the Stairway to Sirius? And were they doing so consciously? John McCain doesn't have Obama's familial link to Sirius and the Nile, but perhaps his symbolic link comes by way of adoption. Ursa Major? Where does that come in? 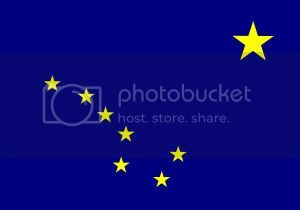 Well, it comes into McCain's symbolic portfolio by way of the flag of Alaska, the state of which his running mate Saraswati Palin is governor. And Palin further linked herself to Sirius with her dog joke at the convention, but it doesn't end there. As Saraswati Palin (freshly impregnated with semiotic signifiers by the media) addressed the convention audience, which sun was she symbolically giving birth to? Was it the Sun of the covertly re-paganizing Evangelicals? 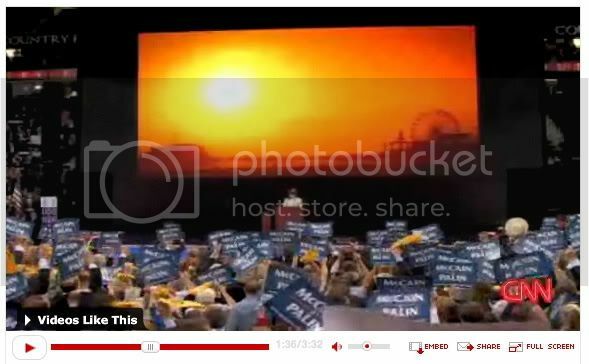 Or was it another sun, perhaps one summoned by the blatant point-in-circle imagery we see represented by the ferris wheel on the right? Now, don't get me wrong, I doubt that McCain or Obama or Palin are even remotely conscious of any of this. And I understand that all of this sounds like madness if you are unfamiliar with the long history of this symbology. But it appears that someone has been going through an awful lot of trouble to tie this election to the ancient mythological symbolism of Sirius (think McCain with his enigmatic green backgrounds, as well). But the question remains- Why? Why go to all of this trouble, over a period of thousands of years, to try to get the attention of these unseen space gods? From Heliopolis to Hollywood and every stop in between, there is an elaborate, secret language at work that is consistent, coherent and predictive. What is so compelling about all of this symbolism which always seems to point somewhere out in the cosmos, even in the ostensibly exoteric religions? What is the ultimate goal to this symbolic conversation, to which you and I seem to be passive observers? This is not just a bunch of crusty old coots in aprons having a laugh, believe you me.